Load cells were used for these tests which measure the force, expressed in kg, necessary to break the part analysed. In a previous blog, “three steps to recognise a good quality padlock”, we underlined that the best material with which to make a shackle, which is the part most exposed to attacks, is steel which has been correctly hardened and case-hardened. In fact, the hardening increases the mechanical strength, and consists in heating the metal to high temperatures and then cooling it rapidly. Whilst the case-hardening of the surface, that is, its carbon enrichment, improves the resistance to cutting. 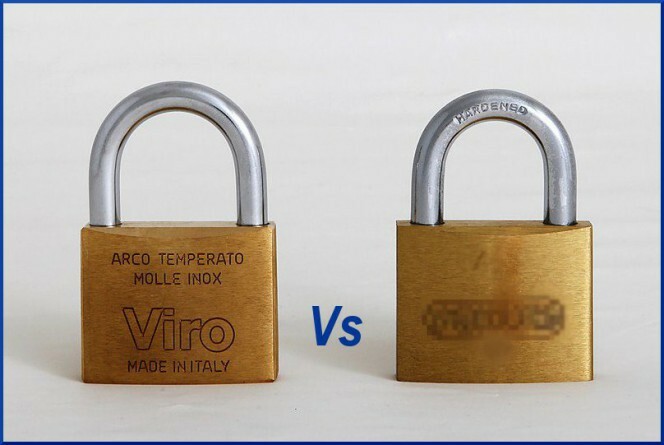 The results obtained following the cutting tests were: the Viro Made in Italy padlock withstands shear up to 3,740 kg (compared with 3540 kg for the imported padlock), that is, 200 kg more than the competitor’s product. The following video shows, on the other hand, how the shackle pull-out withstand test is performed (this example shows a comparison between a Viro “Sea Series” item 375 padlock – stainless steel rectangular padlock with long shackle, with chrome-plated brass body and 40 mm base – and a similar sized product imported from the Far East). A piston is used to apply a progressive pressure (measurable in kg) which simulates the force needed to rip a shackle from the body. When this test is applied to the Viro item 304 padlock the result is about 62% higher than that for the competitor’s product. In fact, the Made in Italy product withstands up to 1,790 kg, compared with 1,110kg for the imported product. The results obtained speak for themselves: one padlock is not worth the same as the other! For this reason it is always good to inquire in advance about the technical characteristics of the product in order to make a valid and long-lasting purchase, which you will not regret.